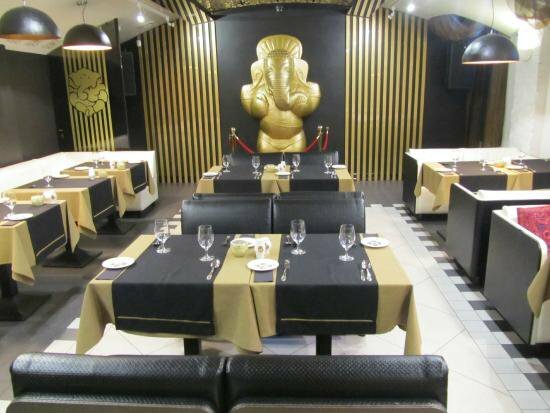 A few steps from Milda, Latvians’ affectionate name for the slender blue figure atop the Freedom Monument, there’s a highly addictive new Indian-themed vegetarian restaurant called Buddha. The owner is a committed vegan who ensures the dishes are always a pleasure to consume. Now it's too cold to sit in the roadside terrace, even though it's protected from the elements and traffic by sturdy canopies and plastic sheeting. So find the restaurant doorway down steps to the side. So far we’ve experienced the business-lunch menu, available between noon and 4pm, and, late in the evening, a smattering of desserts. Ask for their unforgettable homemade goji-berry ice cream (€7.90) or the flavorsome mango ice cream. Spoon it up in time with the shifting evening electro-lounge basslines and alternating neon glows. The daytime menu tends to consist of soup, main course and dessert, together with a warming cup of cinnamon-scented “health tea” and slices of home-baked grain-dotted black bread. All this comes to a pretty reasonable €7.20. Our recent lunch started with a bowl of thick and subtly spicy red lentil soup topped by a scattering of toasted pumpkin seeds. “Cabbage rolls” were next, which appeared to be tightly packed pads of lentils and seeds wrapped in soft cabbage leaves, placed on basmati rice and doused in an onion sauce. Green salad in an unidentifiable sweet sauce sat next door. Finally, dessert was Indian-style burfi, a cubed confectionary made – according to the waitress – from beans, condensed milk and curd cheese. It came topped with nuts and went perfectly with a double espresso. By night – Thursday to Sunday nights to be exact – the interior premises upstairs flash in neon lights amid a dark interior and DJs and dancers come out to play. Mai Tai is the name of the club, and cocktails are mixed in lurid colors while everyone seems to wear a smile – and little else.